Shirts With Random Triangles: Etsy merchant selling Auburn's Jordan-Hare Stadium LEGO kit. Etsy merchant selling Auburn's Jordan-Hare Stadium LEGO kit. Photo via The War-Eagle Reader. If looking for that perfect Father's Day gift for your War Eagle-loving daddy? If money's no object, and you and dad like projects, an etsy merchant may have the thing for you. 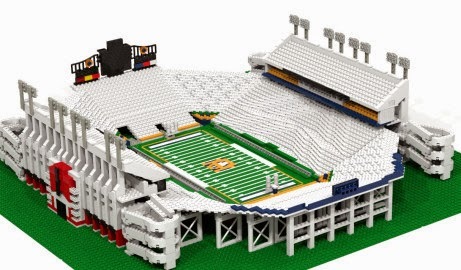 Stadium Brick is selling this unique Jordan-Hare Stadium LEGO kit for $400.00-$1200.00, depending on the size you want. For their hard-earned dollars, the Auburn fan gets "all of the LEGOs, downloadable building guide and the original design file created in LEGO Digital Designer." There are two kits available. One with 1,000-plus pieces (the $400.00 set), and a larger set with 3,000-plus pieces (the $1,200.00 set). Don't worry, 'Bama fans. You're not left out in the cold. Stadium Brick also is selling a Bryant-Denny Stadium, along with kits for Georgia's Stanford Stadium, Michigan's Michigan Stadium, Nebraska's Memorial Stadium, USC's Los Angeles Memorial Colosseum, Oklahoma's Gaylord Family Memorial Stadium, and the Los Angeles Dodgers' Dodgers Stadium. Note: These are all apparently non-officially licensed non-official LEGO products. They are also all listed as "one-of-a-kind," so you had better act fast.